Is edX truly an altruistic venture, or will it begin to generate revenue at some point (e.g., through advertising, selling lists, etc.)? A great article in The Chronicle of Higher Education, “Inside the Coursera Contract: How an Upstart Company Might Profit From Free Courses,” tackles this one. In fact, I’ll just leave you to read about the eight possible business models mentioned in Coursera’s contract with University of Michigan. Will the platform take off? If so, who will use it? Coursera co-founder Andrew Ng co-taught a class on artificial intelligence (AI) last year. According to Reuters, 104,000 people enrolled in the class, nearly 25,000 completed most of the work, and 13,000 scored high enough to earn a statement of accomplishment. Many of these classes are just getting off the ground; it will be interesting to see what the enrollment and completion numbers look like once these courses lose a bit of their novelty. I’d also like to see additional information about who’s taking these courses. Will users really learn via edX, and how will they know when they’ve mastered a subject? Most new online learning platforms aren’t equipped or accredited to grant certifications and degrees; traditional colleges and universities are. I’d be surprised if more colleges and universities didn’t scramble to adopt this approach soon. Nearly every organization I’ve worked with over the last few years has been in the midst of a communications culture change. These organization had mastered the art of print-based communications and marketing. However, it was time to dive in to a new, integrated approach to online and print communications and marketing. By necessity, print-based approaches require tons of checks to ensure accuracy and consistent style. Once a project goes to print, there’s no going back — it’s done. Moving print projects through several layers of editing, copy editing, proofreading and approvals helps ensure accuracy. The upside, the opportunity for extremely consistent branding and style from project to project, often contributed to a downside: slow project timelines. Today, web communications and marketing requires a new approach. Because the web is essentially a series of living documents, web projects shouldn’t follow exactly the same processes as print projects. Sure, it’s a good idea for a few layers of editing and approvals to remain in place, but the first version you post online doesn’t have to be the last version. For example, the web is great for real-time communications. When an emergency arises, it’s okay to post something quickly and then adapt and refine your response as more information becomes available. Similarly, now that we have web analytics at our disposal, publishing a new page is usually the starting point for optimizing the content to the audience’s needs. On the flip side, once you publish something online, it can live on in cyberspace forever. But for most routine web communications projects, so what? Yes, someone could see that you changed the location for an event or corrected a typo. But users today expect up-to-the-minute information, and that includes the expectation that the web changes from day to day. If you’re in the midst of transitioning from a print-heavy approach to an integrated online/offline approach, take heart. 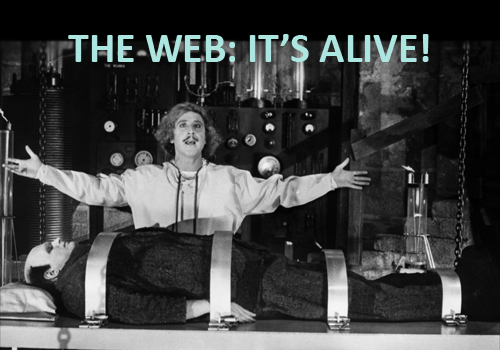 The web is alive, and this isn’t a scary idea — it’s an exciting opportunity to try out a new approach. In 2008, I served as project coordinator as the graduate school I worked for redesigned and relaunched its .edu website (see the website). But we didn’t stop there. We ended up launching three other new sites at the same time (Worldwide Classroom, Resources for Life, and Living Christ Today). It was a great experience that piqued my interest in web communications and provided opportunities to learn quite a bit about web analytics, information architecture, user experience and best practices for web content. Working on the Worldwide Classroom site opened my eyes to the world of online learning. At the time, I knew that many higher education institutions offered distance learning, but there were really only a few institutions that were brave enough to try offering free online learning. Even MIT had only launched its OpenCourseWare site in 2002. This week, MIT and Harvard announced edX, a new online learning initiative. This partnership will support the development of a new online learning platform. edX will soon invite other institutions to participate by sharing free course content on the open-source platform. This is significant news. These institutions made hefty investments in the initiative, and they can offer excellent content. Free and paid online learning will certainly continue to be hot topics for the next few years. And if these institutions can successfully deliver education online, then what’s to stop other industries from doing the same? For example, we could see health care groups (e.g., payors, providers) test out online health education programs. However, some questions remain: Is edX truly an altruistic venture, or will it begin to generate revenue at some point (e.g., through advertising, selling lists, etc.)? Will the platform take off? If so, who will use it? Will users really learn via edX, and how will they know when they’ve mastered a subject? Posterous began as an online photo sharing service. By leaving room for their core idea to change over time, the company, which was acquired by Twitter in March, eventually evolved into a micro-blogging and life streaming platform with a committed user base. Neither Posterous nor the Arcade Fire struck gold on their first try. So why do I continue to think that I’ll strike gold on my first try? And why do you continue to think that you will? Isn’t it more important to be open to the changes that come along and actually put in the hard work necessary to grow a B+ idea/system/product into an A one? If you liked it and/or it was a good idea, then build on it and keep going. If you didn’t like it and/or it was a bad idea, then try something else. Over the last few weeks, I’ve had several conversations with people who are interested in establishing a basic plan for web communications and social media. We’ve all read articles that mandate certain approaches: blog daily, tweet six times per day, post Facebook page updates five times per week. These goals are great … for some organizations. However, the best goals and approaches for your organization are those that are sustainable in your context. Just getting started? The best approach might be to start out by focusing on one platform. It’s okay to say that for your organization and your context, publishing a blog post once a week is a success. Once you’re up and running and consistently hitting your goal, then you can consider whether you want to stick with your current approach or set a new goal. Sustainable and realistic goals lead to lasting success. Don’t let Mashable dictate what works best in your context.